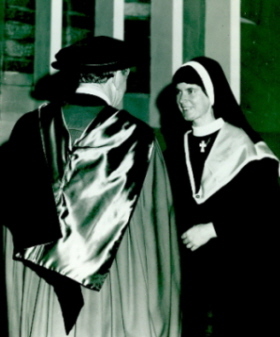 Sr Therese Power received a Bachelor of Applied Science (Applied Chemistry) at the first Conferring of Degrees ceremony held at Ballarat on 11 June 1975. While studying at Ballarat Institute of Advanced Education Sr Therese was Principal of Sacred Heart College (now Damascus College), a position she held from 1974 to 1985. Sister Therese was Congregational Leader of the Sisters of Mercy, Ballarat (2000-2005), and Director of Catholic Education, Ballarat (1986-1998). She is a member of the Australian West Papua Association Central Highlands Branch, and a member of the Ballarat Refugee Support Network. Image Caption (right): Sr Therese Power receives a Bachelor of Applied Science (Applied Chemistry) from Dr R.W. Muncey, President of the Victoria Institute of Colleges. 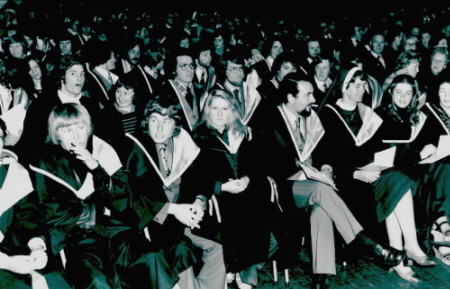 Image Caption (left): Graduands await the first Conferring of Degrees at Ballarat. The graduation ceremony took place at Ballarat Civic Hall.